Remember the CB craze? 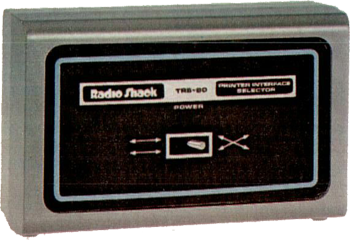 From nothing in 1970 to over 20% of the corporate business in the early 70's, CB radios not only contributed to Tandy's profits, but brought an entire new group of customers into Radio Shack stores. Indeed, things were so good in electronics that Tandy Corp. sold off all its other subsidiaries including the original, Tandy Leather, in 1975. But the abrupt collapse of the CB craze in 1977 left the company in disarray. Enter Don French and John Roach. Roach had joined Tandy in 1967 as a data processing manager and, by 1976 had been promoted to vice president of manufacturing. Don French was on the West Coast in the heart of Silicon Valley and had been trying to get Radio Shack involved in computers, even though his boss, Bernie Appel (recently promoted to president) was opposed. In mid-76, Roach and French were traveling together on the West Coast and stopped in to see National Semiconductor's new SC/MP microprocessor. While there, they met Steve Leininger who briefed them on the hardware and software. Roach and French were impressed with Leininger and wanted to hire him to do some consulting. However, the National Semi marketing people refused to part with Leininger's address or phone. Next stop on the itinerary of Roach and French was Paul Terrell's Byte Shop on El Camino Real. What a surprise when they found Leininger moonlighting there as the night sales clerk. They asked him about consulting, but four weeks later asked him to come down to Ft. Worth to see the facilities. At the end of the day, Roach offered him a job on the spot. Leininger accepted but found that Tandy wasn't really committed to a computer just yet. For six months he, in his words, "played around with a couple of things--an audio pre-amp, a computer kit, and some other minor projects." But as CB turned more and more sour, there was a growing cry at Tandy for something new. They finally moved Leininger off into a room of his own with instructions to build a computer. Leininger remembers it well, "It was there that I wire-wrapped the predecessor of the Model 1. I even put Tiny Basic with the graphics extensions in a 2K ROM." (Tiny Basic was written by Dr. Wang at Stanford and placed in the public domain. Leininger had helped implement it for People's Computer Company. 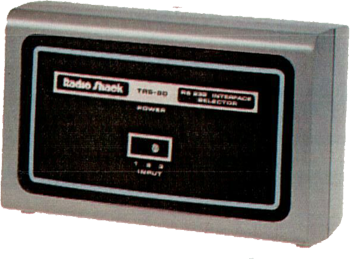 The first 'Tandy' computer was the Radio Shack (TRS - Tandy Radio Shack) TRS-80. Called just the TRS-80, it later became known as the "Model I" when the TRS-80 Model II was announced in the summer of 1979. The Model I was invented by Don French (A buyer for Tandy) & Steve Leininger (The head of the Homebrew Computer Association) and first announced on Wednesday, August 3, 1977, in Radio Shack Press Release 7741-A, at a press conference at the Warwick Hotel in New York City. Radio Shack said they anticipated deliveries to start in two weeks, but was quite unsure of the product, thinking that they might sell 600 to 1000 the first year. It was also the most expensive single item Radio Shack had ever carried to that date. They required a $100 deposit to place the computer on order. In actuality 10,000 units were sold in the first month! Radio Shack was swamped with orders, and delivery times quickly fell to months after order. By early November of 1977, Radio Shack was delivering 16K RAM units with 5 digit serial numbers that had been ordered in early September. At that time, there were separate serial number sequences for 4K and 16K machines. The Model I began with a $599 Level I System with 4K RAM, monitor, and cassette, with all cables and adapters ready to go (except that it took 3 plugs, so you probably needed to purchase a power strip). The Level 1 was soon replaced by a 16K Level II System. 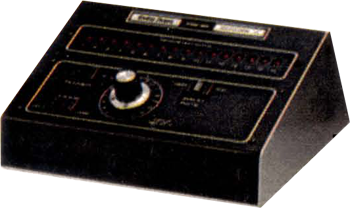 The Level II (first model) was updated to include a numeric keypad. Soon after Level II showed up the Expansion Interface was made available for $299. The Expansion Interface had room for an additional 2 banks of 16K RAM and an RS-232 card. In addition the Expansion Interface already contained a floppy disk controller and a control circuit to allow two cassettes to be hooked up at one time and controlled by the computer. 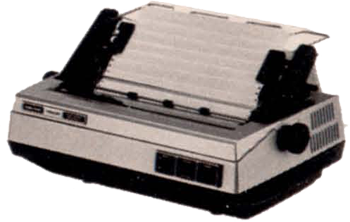 The Expansion Interfeace was a change from the original announcement, which declared that there would be an expansion box with a 5 slot S-100 chassis for the unit. (No price was ever given for the S-100 box that I recall.) Mike Yetso has advised that there was also an 8K RAM for an additional $99, but only a few of those were ever made, and Mike does t believe ANY customers EVER got an 8K upgrade kit -- with all 8K computers being upgraded to 16K. Disk drives showed up the following year for $500. These were Shugart SA400 drives with about 80K of storage. The Centronics Line printer showed up as well. 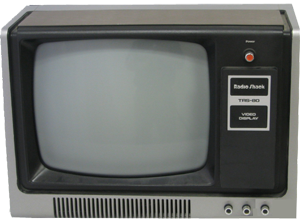 The Model I was discontinued in January of 1981 due to its failure to meet the FCC's Radio Frequency Interference rules. By the time it was discontinued, the Model I had sold over 250,000 units (which was 197,000 more units than Tandy's CEO had intended to manufacture). A Model I (with Expansion Interface and Floppy Drives) is currently housed in the American History Museaum at the Smithsonian Institute. This project started a little over a year ago, really three years ago before I was at Radio Shack, their wanting to get into the blooming computer hobby business. They wanted to build a computer hobbyist kit... When they hired me they were still looking into the kit computer..., a printed circuit board that would perhaps flash some lights. That's where Radio Shack caught me. I was in the National Semiconductor microprocessor system design group, and I was introduced to them as the person who was working on the Tiny Basic for SC/MP. That has since been rewritten and is now distributed as Nible. By now we had pretty well determined what our initial system was going to look like, and we had breadboarded certain segments of it which we knew weren't going to change anyway. I have some of these day-one prototypes here. This stuff is off a card rack, which has since been used for something else, typical but... We had several cards made up. This is the Z-80 CPU card. It's done on standard Radio Shack breadboard, very high-budget operation (laughs). This was the video character generator. There was another card with the character generator, which has been taken apart. The cassette and keyboard interface (holds up a $2.99 4 x 4.5" perfboard that takes 44-pin connector). I don't have the RAM boards with me. We've got two different ROM boards here. I showed you the Z-80 CPU board; we had also made a SCMP, a 6800 and 8080 CPU card. At this time it was still my whole ball game and I did all the wire wrapping and everything. It was sort of a one-man show. And we were beginning to get some of the existing Tiny Basics into ROM, just to show that we had a working unit. The Z-80 decision was made, and we were planning to use 2K of ROM, with a Tiny Basic in it, and 1K of 2102 RAM, for program storage memory. Historically, this would have been maybe a lot of memory to give out with a machine, at the time, considering the original MITS Altair, which came with 256 bytes of RAM, until they figured out that they didn't even have to give you memory in order to get you to buy the machine. We were planning to give you a very workable machine. As you may be aware, the Z-80 supports dynamic RAMs, with very little of the hardware overhead which is traditionally required. So we priced out dynamic RAMs and found out that there is a very large price differential between them and the static type. We breadboarded the thing up with the dynamic RAMs and essentially Li-Chen Wang's Basic with our I/O drivers added. We had all these boards in a little card-cage assembly, screwed under the back end of a table. We had one of the modified televisions and our keyboard on top of that plastic case, and that's when we showed it to Mr. Tandy. He came in, and I don't think he realized we had everything under the table (laughs). What's even more interesting is that people who really knew about it were all nudging each other "heh heh, you know, it's all under the table." When we finally came out with our first pre-production units where everything was inside the case, they said, "Well, let's see what's under the table," and they lifted up the curtain and it's empty. We had the thing back there and he (Mr. Tandy) looked at it and I suppose he understood the, eh, he didn't understand all the technical stuff, like everyone here would understand everything that's going on there, but he I think was starting to understand the financial implications of going into the computer business, and that's when we really got a go-ahead. I guess that was in February (�77), and then I didn't get any sleep for four months. THE CPU: of course we had decided on the Z-80, and the supporting circuitry we've got around that is: the thing essentially surrounded by buffers. All the control lines have been brought out in the most simplified form, Those of you who have the Altair bus-they've got several signals which must be ANDed and ORed, on each memory board, to produce a write or read signal. What we've got we've produced a negative "L", write strobe, memory write and memory read strobe, an input strobe and output port strobe. It simplifies interfacing. We've brought out the signals for dynamic RAM refresh. Making a dynamic RAM interface for this computer is super simplicity. Of course you could also make a static RAM interface. That's even easier because you don't use the three signals available for dynamic RAM. POWER SUPPLY-We've diverged a little bit from the standard hobbyist concept We don't have a 30-amp welding supply built in here like some of these guys do. We've got a power supply that looks like something you might hook onto your Lionel train set or something. What it is, is a little transformer box, very simple to get something like that UL approved. We are currently working on a system where everything is enclosed, but that's our second and third generation. This (multi-unit packaging) was done essentially for the speed of getting the thing taken care of. We had another tradeoff to look at in the area of video displays. We could have gone what might be considered the desirable route from the homeowner's standpoint of down the antenna terminals. Well, there are a couple tradeoffs we have looked at there. One is you're going to be at the FCC for about five years with your computer. It wouldn't be five years, but there's a reasonable chance it would have been longer than six months. And FCC requires you to run your finalized version through FCC testing. And they've got way of just shuffling their feet and going awfully slow sometimes. We are looking at a version that will hook up to the television set. Now we've got something to hold our place in the market while we're working on that. But the other tradeoff involved is that this thing puts out 64 characters per line. With 64 characters/line you've got an approximate video bandwidth of 6 mega-hertz, and on your B/W TVs you've got a sound trap at 4.5 megahertz, on a color TV it's even worse than that - you're down to a bandwidth of about three megahertz, maybe 2.5, and everything smears, you can't read it and we figured that was undesirable. 32-CHARACTER LINES - The computer can be expanded to 16 lines of 32 characters. Under software control, you can display 16 lines of either 32 or 64 char- actors per line. Level I Basic does not support 32-character lines, but machine language in Level I machines does, and Level U Basic gives you choice of 32 or 64 characters/line. Characters in 32-space lines are much wider, and they can be run down a standard television antenna. Of course you have all seen articles about how to connect to a TV or you can go out and buy a Pixi Verter. But I'm not supposed to tell you that (laughs). Right now we'll tell you what the video outputs are but we're not going to give you a schematic on how to hook it up to your TV. Most people are clever enough or can find someone who is clever enough to do this kind of stuff. For video display, we are recommending our monitor. It is a monitor made by a famous TV manufacturer, to our specifications. That's a line-operated television set and to keep people from fritzing our computer or themselves or both, we've got a circuit that we did, An optical coupler inside the computer provides up to 3,000 V isolation between the computer and the keyboard (TV! 110V line? Ed.). We did add graphics to our video capability, and our graphics are very similar to PolyMorphic's. It was not an intentional - we did not blatantly copy PolyMorphic's graphics, it's just that it's a very inexpensive graphics to come up with. KEYBOARD - Kind of interesting, we've departed from what a lot of people usually do. 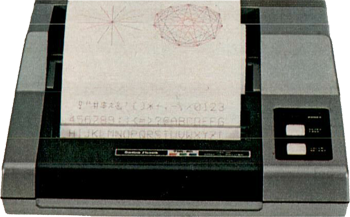 Many of the existing hobbyist systems have a keyboard scanner that does the keyboard scanning and gives you an ASCII output. We did all ours under software control, essentially setting up a matrix and having the software scan the keyboard. With one quick instruction we can see if any keys are depressed. In some people's opinion this may not seem the most desirable way to go, but it is by far the least expensive route. We have taken what might be considered a few systems shortcuts, which we feel gives us the best possible product per dollar. LEVEL I BASIC - it's in a 4K ROM. We started out by looking at the Li-Chen Wang Basic, it's in the public domain, of course it's integer. What we did, we went back through the Wang Basic and completely tore out about 60 per cent of it, the integer overhead and all that kind of stuff. It's got a full floating-point package in it now, add, subtract, multiply and divide, it doesn't have the transcendental functions, we've got a Level II Basic, which will be available by the end of the year. Right now, we think this is the easiest entry for somebody who doesn't know everything about computers. As it's turned out, we've found out that most of our customers know EVERYTHING there is to know about computers (laugh). Everyone keeps calling up and saying, "Why didn't you do it this way..., that way". You know, nobody was there to give us input for the first time, so we did it what we felt was the best way. HARDWARE - (Pointed out the original breadboards, which had been cannibalized, the first pre-production prototype, from which Mr. Tandy gave the go-ahead "it had a professional wire-wrap board in-side it. I had ended my happy wire-wrap days. Dr. Lien has been using that unit for about six months and I guess it still functions. And we have several different versions there, up to our current production model, which is this"). We'll take a dumb look at the outside. We've got the power switch back there. We made a value judgment you don't want the power or reset switches on the front panel, because you reach a little too far into a carriage return or something like that and your machine shuts down. You could be disappointed, so we put those switches in the back. We put all connector cords on the back also. The 53-key keyboard- contrary to a popular rumor it is not the same unit as we sell in the stores, although that's really not a bad keyboard, they're both made by the same manufacturer, Rytek. The power supply is kind of interesting. 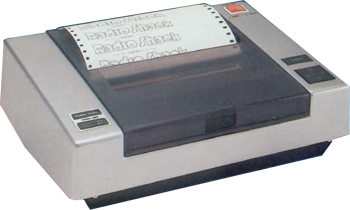 It was developed at Tandy Systems Design, another branch of Radio Shack. On both the 12 and 5 Volt there is fold back current limiting. What that does protect you from is that a lot of companies use the three-terminal regulators, which do not have fold back current limiting. That is not so much a problem on S 100-type boards, where you do not have that much logic on one board, but I've got a Compucolor where everything is driven off a single three-terminal regulator, which shorted and sort of ate my computer's lunch. So in our judgment the best bet was to put the current limiting and all that in there. Theoretically, three-terminal regulators will go into thermal shutdown, but that's in theory and not necessarily practice. So we decided to play it safe there. The RAMs are in sockets. We've got a couple DIP headers (plugs) that go in to tell the computer whether you have 4, 8, or 16 K RAMs on the board. There are two sockets for 2708-pinout-compatible masked ROMs. We've got a few machines right now that are running with 2716s, the 2 K-by-8 EPROM's, but at $212 per whack, we can't ship those out to the Radio Shack stores. The board is laid out for automatic insertion of components. We're not at that stage yet (Sept. �77), but there are indications we might be into that soon. There is one other signal that I failed to mention, on the bussing. That's a signal called Test. When that signal is brought low, it tri-states the processor internally, and all its output buses. What this lets you do is go in there, and from somewhere on the external port exercise all the all of the internal RAMs, the ROMs, the keyboard, the cassette I/O, and verify proper operation of the computer. We found this to be helpful in testing our computers in the Fort Worth final assembly station. CASSETTE - I guess I didn't mention the cassette. We made another grand value judgment there, and we've caught a little flack from it and I thought maybe I should explain why we did what we did. Our cassette standard is very similar to a method employed by Hal Chamberlin in a newsletter he published called The Computer Hobbyist. It's something many people are not aware of that's pre-Byte and pre-Kilobaud, but he had a method in there that's very similar to the way a floppy disk functions. It records one pulse for a zero and two pulses for a one. On Level I machines our baud rate is about 250. We've done this as the best tradeoff between reliability and being able to use low-cost cassettes. The Tarbell standard, with which I'm sure many of you are familiar, is much faster. It unfortunately requires quite a bit of hardware, and will not always run reliably with a $40 Radio Shack tape recorder. What's a Tarbell interface go for now, $100? That's about how much it would have impacted our system cost, so that instead of a $600 system you would have had a $700 system. Some people say "Well, it would have been worth it to me", but one of our judgments was that it wouldn't be worth it to everybody. S 100 COMPATIBILITY- The output port here can be adapted to the S100 bus, or the Southwest Tech bus, or just about any bus that exists out there right now, because of the generalized nature of its I/O. Since we don't split the data bus, that can all be done externally, you can split it. The S100 bus of course has two data buses, an input bus and output. You'll have to sort of fake some of the control lines or some of the control signals that, really what you're doing is un-ANDing them so that when they get all ANDed back on the computer boards it all comes up the same again. There will be an S 100-bus adapter board available. I'm not sure whether it will be available in the Radio Shack stores or not, but having worked in a Byte shop before, if there's a chance to make a quick buck out there... I don't know how many of you guys run a business out of your garages, but it's a thing I have done and I know it's something that someone will jump on if we don't, so we're going to play it by ear and see who jumps first. PRINTERS - We've got two printers that will be available. One's less than $1500, the other is less than $700. The more expensive one will be an impact printer, 65 characters per second, the other will use electro sensitive paper and run at 2200 characters per second. There may be two versions of the latter, the one that comes out first will use paper about 4.5" wide. It can print a page off the CRT in less than a second. We are of course keeping our ear to the ground in case someone comes up with a $100-ilk Diablo-type printer, (laughs). 12 K BASIC - Our 12 K Basic is probably as outstanding a Basic as you can find out there. It's one that's been in use for two years now. Some of the more clever of you might be able to figure out whose we're using. We are using it under a license agreement, as opposed to - there are a few companies out there who would say, "Hey, that's a good Basic, we'll just..." it will again be in a ROM, which can be retrofitted into current machines, in the Radio Shack stores. The nearest competitor, one you've got this 12K Basic in there, would be the IBM 5100. It's going to be powerful. There are two ROM sockets. We will be using, in the 12 K Basic, an 8 K-by-8 and a 4 K-by-8 ROM. 1) We start using ROM from location zero up through the first 12 K.
2) The next 4K is reserved for the keyboard and the video-display memory mapping. 3) And then the next 48K is all RAM. That's the way we have it set up right now. Of course, anyone can stick RAM up in the top if they want, but that's not the system that we're supporting. At this time we have no specific plans to support high-speed cassette. If we see the demand is out there we're going to jump on it. We've got some high-resolution graphics coming up. First the system that hooks up to the television set, that's still in the works, there's a lot of paperwork. Guarantee - 90-days, parts and labor. Radio Shacks have 56 service centers coast to coast. We are working on an arrangement so that a maintenance contract can be purchased, similar to what IBM would supply, or Sears would supply on a refrigerator or something. We feel that this is going to be the way to go on computers. Hardware documentation - initially we had planned on not supplying the logic prints with the thing, and we got into such an uproar that we pretty much changed our mind on that. There was some corporate fear that someone was going to whip open his garage door and crank these things out, you know, beat us to the punch. Since then we have come to the startling conclusion that, you know, we probably get better parts on prices than they do. So the logic diagrams will be available. Software listings, our 12K Basic, you'll probably never see a listing of it, because it's not our Basic. Keyboard - in hardware, you've got 64 possible keying combinations, and you're decoding 53. Is there a way of adding some extra functions? We're looking at adding some more. Of course we've got a 53-key keyboard there right now. As you've seen, the keyboard is on a separate board (from the computer). You can see, we can poke this thing out (bezel next to keyboard, with TRS-80 written on it, not removable in later production models), and put a board on there that has a numeric keypad. There are many things we could do. That was one of the tradeoffs, by the way, that I forgot to mention. Initially we were looking at a calculator keyboard for this thing. One of our competitors is using a keyboard that is not much better than a calculator keyboard. We came to the conclusion fairly early in the ball game that the extra money spent on the keyboard is probably the smartest thing we've done. It's a much better feeling keyboard, and I think we made the right decision here. Weird peripherals - The TRS-80 bus will support anything. Since it's really an extension of the Z-80 bus that's been cleaned up a little bit, it will support anything that you want to put out there - if you want to control your merry-go-round with it. You know, we get those kinds of phone calls: one guy wanted to hook it up to his toaster. And of course every other phone call, a guy wants to hook it up to his lawn sprinkler. That's going to happen one day, but it's probably not going to be with this machine, and it probably won't be with any of the machines out there now. I venture to say nobody really wants to hook up a $2,000 IMSAI to his lawn sprinkler. You know, just let it sit there and sprinkle his lawn. You'll have dedicated electronic lawn sprinklers some day. Power supply - The power supply itself, since it's internal to the thing, I don't know if the specs mean too much. We don't support external devices with the power supply that comes with the unit. From just a curiosity standpoint, it draws less than an amp at 5V, and about 200 milliamps at 12V and about 50 micro amps at -5V. One reason for the lower levels of the power supply is that all the TTL possible is in low-power Schottky, it costs a little bit more but it saves a little power. Clock speed- it's ballpark 1.8 megahertz, 563 ns on the nose. That was derived from our video timing chain. That's another big cost-saving feature. And we could also use slower memories. A key to this whole computer is that we designed around existing parts. Sure we can get a microprocessor that will run at 4 MHz, but I defy anybody to build a system like this, at the current prices, and have the thing run full speed with the type memories we've got in it. I don't believe it could be done. Interrupts - "You only bring out one interrupt, what about external rigs?" You may be familiar with the Z-80. There are two interrupts on there. The non-maskable interrupt we use for our reset. The reason for that is that if you use the traditional reset, while that is low, the whole processor stops processing, and while it stops processing, it quits refreshing dynamic RAMs, and when you do that you lose memory, and customers. So we dedicated that interrupt to our own uses. Teletype - "Can this system talk to...?" The current version (Level I Basic) does not support the serial interfaces. The next version (12K) will support the serial interfaces or external devices. Converting from ASCII to Baudot is simply a software problem. Lowercase - Right now we're not supporting lowercase; we've had enough interest that we may be looking into it, though. There seems to be quite an interest from the word processing industry. In similar manner, with lowercase we may also be looking into expanded number of characters per line, 80 or more. Again this is going to take some hardware changes. These are things we are looking at for our second and third versions. We sort of see our current computer as square in the middle of no-man's land. You know, the high-end consumer and the low-end business, and we're going to branch in both directions. Compatibility with later models, "Will you be lost completely?' You will be for certain applications. For example, this computer, since it is limited to uppercase, is not ideally suited for word processing applications, where you've got upper and lowercase. Our upper and lowercase machine is still probably more than a year off. We're trying to maintain as much upward compatibility as possible. We're being very careful along those lines, and we feel that the person who buys one of these machines today will not be disappointed in a year from now. And of course we maintain our spare parts backup on anything we sell for a minimum of 7 years - it's more like 10 years. Ten years from now, who knows what computers are going to look like? Factory location - They're being manufactured in Fort Worth. Part of it is being sub-assembled in Austin Texas; the whole thing though is being assembled in Fort Worth. While Tandy Corp. does have Japanese electronics manufacturing firms under its wing, we feel that the quality control which we wish to exercise over it right now is going to require us to manufacture them in Texas right now. Marketing- "A lot of us are confused as to how Radio Shack or anyone is going to take on something like this, which is really much more sophisticated than their other products?" We're looking at different avenues for selling product. Tandy Corp. has recently announced a Tandy Computer Store. Tandy Computers is much like Byte Shop and Computer Land, it's Don French's outfit. That's being opened on an experimental basis on Oct. 1st in Fort Worth, just so we can get a pulse on it. Fort Worth may not be the computer capital of the world, but it's close enough that Mr. Tandy can walk in and shake a few people if something is going wrong. Marketing computers is getting interesting. We feel that we have a jump over some people. For example I understand that Sears will be marketing a computer, and from what I understand it's supposed to be the Commodore unit. That's all hearsay, and I think that's all you'll get from anyone now. Macy's is supposed to be handling the Compucolor. The Compucolor, as you know, is a $2,700 computer. We feel that's far out of the range of anything Radio Shack could sell. Up until now, the most expensive we've had is the STA-2000. That's a $500 stereo receiver which is one of the better receivers available in that price range today. I realize that (our computer) may not be as flexible as an IMSAI or Altair, or whatever, but for $600 we feel you are getting at least your money's worth, and we hope to make it maybe more than your money's worth. Market target - We originally thought our market was going to be the home consumer. That's the ideal - we said, wow, if we can get one in every home, at so much, you start seeing all those big numbers, we'd get into buying AT&T by the end of the year. Eventually we're going to be getting back more towards the consumer. This computer has generated so much business-community activity and interest that we will probably have a spin-off corporation that will do nothing but handle business areas of it. And if we keep our prices the way they are, of course the hobbyist can take advantage of the improvements we make in those areas. Availability - We are doing everything we can to bring up production. One of the biggest problems we've had is that corporate people who make decisions - you know, we'd come in and say "we've got the greatest thing since sliced bread, a computer everyone's going to want". They didn't want to commit to it. Radio Shack doesn't climb out on a limb too often. 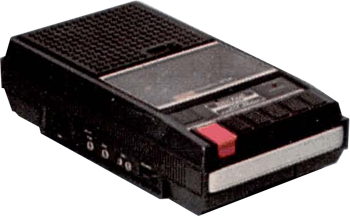 Too many other companies have; look at Sears with its Cartravision color TV/tape recorder. They lost money on that. They're being a lot more careful, I would imagine, with their computers. We're being careful too. What we see right now is that we've been much more careful than we should have. It's a case that if we had 10,000 in the warehouse right now we'd probably have them moved off by the end of the month, with very little effort. We're not pushing this as hard as we will once we get production up. You'll see Paul Burke on television with our computer, or something like that. You're not going to see that this week, or by the end of the year. Next year, it's a very real possibility. Not too many years ago. the pocket calculator we take for granted today could have passed for a powerful computer, and one worth a great deal of money Today, however, there is much more to the definition of a computer. The computer is in some respects like a super-power calculator, yet it is very different. Calculators work with numbers. They add. subtract, multiply and divide. Computers work not only with numbers, but with alphanumeric data -names, words, stock numbers. A computer can be programmed to repeat the same function over and over. It can compare a list of stock numbers with one you have asked it to find or alphabetize a list of names. It can logically evaluate information given to it, and act on its findings. It can store large volumes of data for future use or reference. It can converse with its operator, asking questions like "Your totals don't balance. would you like to put the data in again?" or "Would you like the results printed out, or displayed on the video screen?'. Obviously, a computer is much more than just a "number-cruncher." It is literally an extension of the mind. It is to man's mind what the lever is to his arm - a machine capable of increasing his effectiveness. It can free you from repetitive exercises which do not require human judgement. It can provide facts and figures with extreme speed, giving you the time to exercise your judgement thoughtfully. Not many years ago, a computer with the power of the TRS-80 would have cost over a million dollars. The equipment would have filled large rooms. The advancing technology of integrated circuits led to the microprocessor - literally a "computer on a chip." This, in turn, drastically reduced the size and cost. The TRS-80, a product of these advances. is manufactured and sold only by Radio Shack. What does a computer do? Not too many years ago. the pocket calculator we take for granted today could have passed for a powerful computer, and one worth a great deal of money Today, however, there is much more to the definition of a computer. The computer is in some respects like a super-power calculator, yet it is very different. Calculators work with numbers. They add. subtract, multiply and divide. Computers work not only with numbers, but with alphanumeric data -names, words, stock numbers. A computer can be programmed to repeat the same function over and over. It can compare a list of stock numbers with one you have asked it to find or alphabetize a list of names. It can logically evaluate information given to it, and act on its findings. It can store large volumes of data for future use or reference. It can converse with its operator, asking questions like "Your totals don't balance. would you like to put the data in again?" or "Would you like the results printed out, or displayed on the video screen? ': Obviously, a computer is much more than just a "number-cruncher." It is literally an extension of the mind. It is to man's mind what the lever is to his arm - a machine capable of increasing his effectiveness. It can free you from repetitive exercises which do not require human judgement. It can provide facts and figures with extreme speed, giving you the time to exercise your judgement thoughtfully Not many years ago, a computer with the power of the TRS-80 would have cost over a million dollars. The equipment would have filled large rooms. The advancing technology of integrated circuits led to the microprocessor - literally a "computer on a chip." This, in turn, drastically reduced the size and cost. The TRS-80, a product of these advances, is manufactured and sold only by Radio Shack. Perhaps the best way to really explain the computer is to ask the question. . . Large computers are well known in the business world for their ability to do bookkeeping, billing, payroll, inventory control. and analysis and forecasting of business data. Laboratories, engineering firms and universities have used computers to analyze volumes of data and numbers in a wide variety of applications. As we said, a computer works with alphanumeric information, not just numbers. It can alphabetically sort a mailing list, find subscribers who have not renewed, locate slow-moving inventory items, write purchase orders based on sales trends and current inventory levels, or simply catalog your butterfly collection. And it can become an automated teacher of math, spelling. American history or what have you. For entertainment you can spend hours playing really challenging computer games, from chess to space war. The TRS-80 Microcomputer System is capable of performing all of these activities. In general. it differs from its larger cousins in speed and the amount of information which can be kept on line at any one time. Keep in mind the TRS-80 isn't a panacea -it's a computer. Study your needs carefully and buy the TRS-80 system that's right for you - expansion could be the answer. For example, a simple Level-! 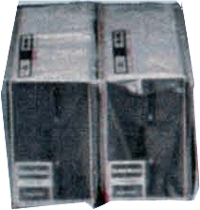 4K inventory system could handle 22 items (64 characters per item), while a disk system TRS-80 could store about 1300 items per data diskette. Remember, too, that you'll need to write programs (our manual tells you how) or have them prepared to suit your specific needs. Visit a nearby Radio Shack for help in choosing your system. Why a personal microcomputer? Because today's complex lifestyles require a method of getting more things done in less time. The TRS-80 has made true computing a reality for the small business, laboratory, classroom and the home. Radio Shack's TRS-80 is the personal computer for anyone and everyone! Radio Shack's TRS-80 Microcomputer System is fully wired, tested and U.L. listed for electrical safety - you can put it to work immediately! It's ideal for finances, education, accounting, lab use - even for home entertainment. And it's the computer with a full line of accessories being delivered now with more to come in the future. Basic TRS-80 systems include a 12" video monitor, Realistic battery/AC cassette recorder, power supply, 232-page user's manual and a 2-game cassette tape for playing Blackjack and Backgammon. 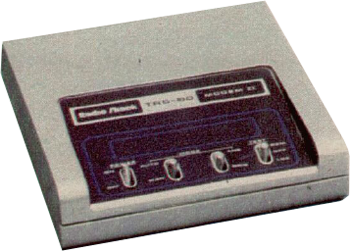 The TRS-80 comes to you ready to be programmed, either from pre-recorded cassette tape or from the keyboard. A "program" is simply a set of step-by-step instructions telling your TRS-80 what you want it to do. The TRS-80's programs are written in easy-to-learn, plain-English BASIC programming language (BASIC stands for "Beginner's All-Purpose Symbolic Instruction Code"). The user's manual includes a beginner's course in BASIC that'll have you "talking" to your computer in no time. The TRS-80 talks back to you via its 12-inch video screen. Inside the 53-key professional keyboard housing is the actual "brain" of the computer - a powerful Z-80 microprocessor that serves as the central processing unit (CPU). Programs and data are stored in internal "memory chips." Our lowest-priced TRS-80 computer contains 4096 bytes (4K) of user memory, or RAM (a byte being roughly equivalent tp one typewritten character and made up of eight electrical signals called "bits"). It can be expanded to 16K within the keyboard unit and to 48K by using the Expansion Interface with additional memory options. Note - the Z-80 is an 8-bit microprocessor and can address a total of 64K of memory. Both ROM and RAM are addressed in the TRS-80, along with some internal "overhead." In a 48K RAM configuration, the last memory address is 65,535 -the usual ending address for a 64K computer. The video monitor looks like a standard television set without the channel selector. It features a wider bandwidth than most TV sets for a sharper display of printing and graphics. The monitor operates on ordinary 120-volt AC. 60 Hz house current. Foreign versions are available in other countries and are sold only overseas by Tandy Electronics outlets. The computer cannot be connected directly to a standard TV set. For access to other hardware, the TRS-80 utilizes a unique 40-pin bus (connector system) that can attach the TRS-80 to our Expansion Interface, or other external devices. Housed in the finest ABS material, the TRS-80 is virtually unbreakable. It may be left "on" for extended periods of time with no adverse effects, as long as the cooling vents are not obstructed. Low Cost. Seldom has such a technologically advanced piece of electronic equipment been made affordable to the general public. 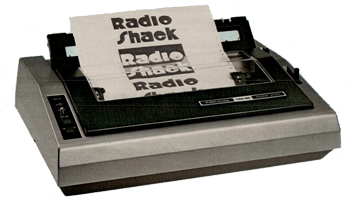 But Radio Shack broke the price barrier, and made the personal computer a reality. Value. Most people regard their TRS-80 as an investment, and often it yields a return that exceeds their fondest dreams. That's because TRS-80 is what a personal computer should be, a powerful system that's easily expandable. Availability. 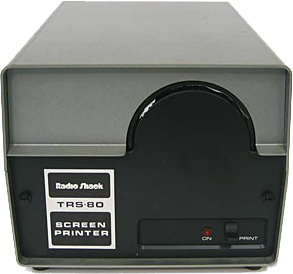 The TRS-80 and its accessories are supplied through Radio Shack outlets nationwide and we have over 5800 locations. You can stop in at one near you and actually see and try the TRS-80 before deciding on your purchase. It's easy to use. Our Level-I TRS-80 system allows the user to learn programming with absolutely no previous knowledge of computers or programming. Our superb user's manual is written in a light and humorous style that makes learning fun. And the TRS-80's BASIC language is stored in permanent Read-Only-Memory (ROM), so it's ready to use the second you turn on the power. It's expandable. Even the smallest TRS-80 system can be expanded into our largest business system - and you pay no "premium" for not having purchased the biggest system in the beginning. With the Expansion Interface you can add more memory for a system with up to 48K RAM, plus printers, disk drives and much more. And you can convert to one of the most powerful microcomputer languages available. our Level-II BASIC. We build it ourselves. To insure highest quality at an afiordable price, Radio Shack designed the TRS-80, and we build it in our own factories. We have taken maximum advantage of state-of-the-art engineering and our manufacturing expertise to produce the best value-to-cost ratio on the market. Service. If repairs are ever needed, Radio Shack has a nationwide network of over 50 service centers to minimize "down time." You simply return the component in need of service to your nearest Radio Shack store - we do the rest. Reputation. Radio Shack, with 58 years' experience to our name, is the nation's leading electronics retailer. We're backed by our NYSE-Listed parent, Tandy Corporation. You can depend on us in the years to come to stand behind our product and to offer an ever-growing line of both accessories and programs. Who can use the TRS-80? Thousands of people from all walks of life already own the TRS-80 Microcomputer. Why? Because they saw that it could serve to enrich their lives. At work and at home. the TRS-80 is exceptionally versatile. And that's why so many people are using it. Businessmen find the TRS-80 gives them the edge on the competition. So much of their time is spent on tedious, repetitious paperwork that they often find little time to devote to the more productive areas of their job. But with a TRS-80, tasks like inventory, general ledger posting, payroll and accounts receivable can be processed quickly and effectively. Accountants find it invaluable in tax preparation, cost accounting and in keeping clients' records. 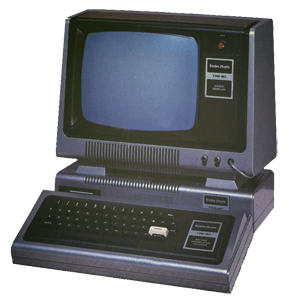 Engineering firms, manufacturers and large businesses use the TRS-80 for specific jobs too small or too costly to run on a large computer. Programmed to catalog specimens, classify drugs and perform needed statistical and data manipulation, the TRS-80 microcomputer becomes an inexpensive and reliable clinical lab assistant. The TRS-80 is an invaluable - yet affordable - educational tool. Computer-assisted instruction is ideal for students who require repetitive instruction and immediate evaluation of their progress. And homeowners find more uses for the TRS-80 every day. Already they use it to manage the household budget and to keep purchase dates, serial numbers and repair history of home appliances and valuables. How do owners like our TRS-80? A school system tells us that the TRS-80 has made computer-assisted instruction available to them for a fraction of their previous cost per student-hour. A Civil Engineer reports laborious structual concrete beam calculations requiring hours are now completed in less than ten minutes. A father writes to tell us "this investment is one of the most significant in value to our family and to the future education of our child that we have ever seen." The limits of what the TRS-80 can do depend upon the creativity of the user, and his or her needs and imagination. As an educator put it, the TRS-80 "makes possible the tapping of human innovation and creativity on an unprecedented scale." On display at over 7000 Radio Shack Locations, TRS-80 Model I is a microcomputer you can see and try before you buy. It's a proven system, used by business people, professionals, and "just plain folks" everywhere for accounting, education, lab work, budget management, word processing - even games at home. Model I comes wired, tested, and ready to operate. It is supported by our growing line of software (programs for specific jobs) and accessories which are available either "off-the-shelf" or on a quick-delivery basis wherever you see the Radio Shack sign. 4K, Level I "Starter" System (26‑1051): Our lowest-priced Model I TRS-80 computer contains 4K bytes (4096 characters) of RAM (Random Access Memory). RAM is internal memory space accessible to the user for program and data storage. This system is programmed in "Level I BASIC", an easy-to-learn computer language that's ideal for beginners. To get an idea of the system's capabilities "right out of the box," see the Level I software listed on page 9. The 4K, Level I system is modular and can be upgraded at any time to meet future requirements. Includes computer/keyboard unit, 12" video monitor, cassette recorder, game cassette, and a superbly written user's manual that teaches you to write your own programs. U.L. Listed. 16K, Level II System (26‑1056): Level II is an advanced version of BASIC that offers vastly increased computing power and advanced programming features for greater versatility. The 16K, Level II system is the "standard" Model I ooniguration and ideally suited to many small business and professional jobs. It can be equipped with a printer and other accessories shown on the facing page. Includes all Level I hardware and Level II Reference Manual. Computer/Keyboard unit includes built-in 12-key numeric datapad. U.L. Listed. The Radio Shack TRS-80 Level I language is the way to learn computer programming. It's a simplied version of the BASIC (Beginner's All-Purpose Symbolic Instruction Code) programming language, and allows you to "talk" to the computer using simple English commands and statements. Even if you have no prior knowledge of computer operation or the writing of programs, our easy-to-understand teaching manual lets you quickly learn how to program the TRS-80. Level I includes most standard BASIC commands and also several outstanding features, such as a screen display of 16 lines of 64 characters. 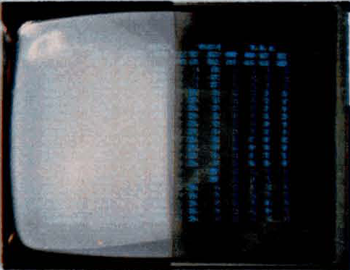 48x128 video graphics, 250-baud cassette input/output rate, floating point arithmetic, 6-digit numeric accuracy, single dimension array, limited string variables, command abbreviations, and error codes. Level I is stored in 4K of Read-Only Memory so it's ready to use the instant you turn on your TRS-80 Computer. If you're experienced with Level I, be prepared for some pleasnat surpises with Level II. Level II is a far more advanced or "extended" version of of BASIC, and offers vastly increased computing power (its execution time is 30% faster than Level I's) and additional features. You can choose a screen format of 16 lines of either 32 or 64 characters - both with automatic scrolling, and the 500-baud cassette input/output rate is twice as fast as Level I. In addition, Level II offers multi-dimension arrays, comprehensive string variable handling, automatic line numbering, tracing, PEEK and POKE, call-up of machine language routines, printer commands, and 23 specific error messages. Versatile program editing with extensive editing commands allows easy modification of your programs. Level II offers increased numeric accuracy of up to 16 significant digits; intrinsic functions remain at 6-digit accuracy. Program lines, logical lines, and string variables may be up to 255 characters long (overflow moves to the next screenline). A compressed storage format allows some programs to be stored in fewer bytes of memory than in Level I. Level II is stored in 12K of Read-Only Memory, and comes with a comprehensive reference manual. The TRSDOS operating system includes the software and input/output functions needed to operate the TRS-80 Disk System. TRSDOS allows vast file storage space, expanded file manipulations, and much quicker access time than you get with tape storage. Disk BASIC allows you to access files either randomly or sequentially, and programs may be stored in BASIC as ASCII or in compressed format files to save storage space. Radio Shack's Disk BASIC is a further extension of the Level II language. A few of Disk BASIC's extension commands are DEF FN - allows userdefined functions. HEX CONSTANTS - allows you to enter hexadecimal and octal constants by preceding them with "&H" or "&", and TIME$ - returns date and time as a text string. Keyboard: Full-size 53 key. 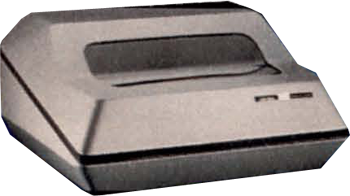 Level II also has a 12-key datapad. Measurements: 16-1/2 x 8 x 3-1/2"
Video: 12" RCA white-on-black monitor (16 lines x 64 characters text; 48 x 128 graphical 'squots') with the tuner card removed and the TRS-80 interface card added, painted "Mercedes Silver". Power: 120 VAC, 60 Hz, 50 Watts. Measurements: 16-1/2 x 13-1/2 x 12". Storage: Cassette [250 Baud (Level I)/500 Baud (Level II)]. Level II BASIC (ROM) Kit 26‑1120 $120.00 When you've mastered the Level I programming language, you can move up to higher computing power with Level II. Conversion is easy - we simply exchange the ROM chips in your TRS-80 for chips containing Level II. Your local Radio Shack store can arrange for the exchange. Incorporate Level II into your 4K or 16K RAM Level I TRS-80. Numeric Keypad 26‑1103 $79.00 Makes entering data a lot faster when you're used to using a standard calculator. Enter by either the keypad or typewriter keyboard numerals. 16K Memory (RAM) / Keypad Kit 26‑1101 $230.00 Increases TRS-80's Internal Memory The TRS-80 is designed for easy upgrading to a full 16K of RAM memory inside the keyboard unit. Your nearest Radio Shack store can arrange for the exchange of your 4K for 16K chips and add the keypad. 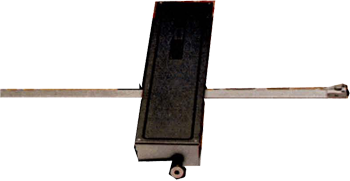 Lower Case Kit 26‑1104 $59.00 Bring your keyboard Unit and we'll do all the rest! Parts prices only. Required installation is extra. Quality lower case for your Model I display and compatible printer. "Driver" tape included. NOTE: Some non-Radio Shack software will not work with this kit installed. Not intended for use with programs written in upper case format. $597.00 (32K) Expansion is a key word in the TRS-80 philosophy. The TRS-80's modular design lets you expand to just the system you want. Of course, you can add 16K RAM and Level II BASIC to the keyboard unit. Beyond that point, the Expansion Interface becomes the hub of expanded TRS-80 computer systems. The Expansion Interface measures 4 1/2 x 16 1/2 x 8" and is designed to sit directly under the video monitor acting as a base for it. 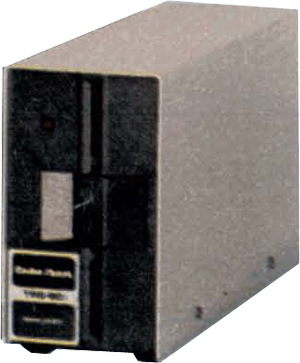 The TRS-80's power supply module, and an identical one for the interface, are housed inside the interface enclosure. Space is also provided for our optional RS-232-C Serial Interface Board. A cable approximately 6" long connects the interface to the TRS-80 bus connector. 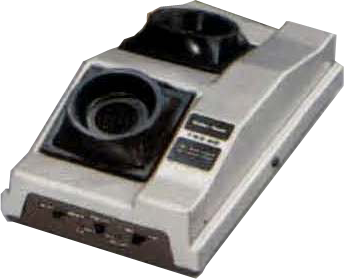 The interface provides output connectors for our TRS-80 printers, disk drives, dual cassette recorders, and an RS-232-C serial port, as well as an extension of the TRS-80 bus, the controller for the electronic circuit needed to install up to four TRS-80 Mini Disk drives, a printer and dual cassette recorders are an integral part of the Expansion Interface, as are the provisions for an extra 16K or 32K of optional RAM. The printer output port is a standard Centronics parallel circuit. This parallel port and our RS-232-C serial port allow connection of a variety of peripheral devices. Pin-out information is provided in the owner's manual. Each requires 120VAC, 60Hz, 50 watts. U.L. listed. 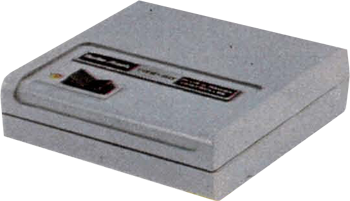 TRS-80 Model I Double-Density Disk Kit 26‑1143 $149.95 Expand the disk capacity of your Model I and add the advanced features of Model III's TRSDOS operating System. After Radio Shack has installed the kit in your Expansion Interface, your existing Model I software may still be used "as is" in single density mode. With the all new Double-Density Disk Operating System, use advanced features and gain increased disk capacity with your current disk drives. With 35-track drives, disk capacity per diskette is increased from 84,000 to 152,000 characters after noemal normal system information. With a 40-track drive, formatted disk capacity is a full 184.000 characters, 737,000 characters with four 40-track drives. COPY moves flles from single-density to double-density format or from double-denslty to single-density. In addition to expanding TRSDOS to include new features, we have added most of Model III's Disk BASIC enhancements as well. This includes full suppord for variable logical record lengths, and a series of CMD functions that sort strings, cross-reference string variables, delete spaces, and much more. Since our Double-Density TRSDOS contains manu new features, modification of some existing software may be required for use with double density. Even though most BASIC programs and many machine-language programs will run "as is" in Double-Density TRSDOS, Radio Shack applications software is not available or supported for double density operation. Kit includes operating system manual, adapter, and Double-Density TRSDOS operating system diskette. Price does not include required installation. 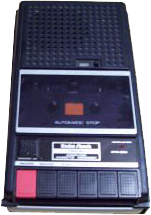 CTR-80A Cassette Recorder 26‑1206 $59.95 Ideal for loading and recording cassette programs and data. U.L. listed. AC operation or 4 "C" batteries (not included). 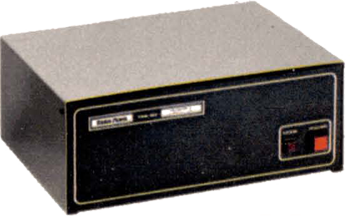 TRS-80 Mini Disk System 26‑1160 $499.00 The TRS-80 Mini-Disk system is a storage medium allowing immediate access to large amounts of data and programs you will need for accounting, inventory control, mailing lists and other jobs. Up to 4 drives can be attached through the expansion interface, furnishing 49,900 to about 307,000 bytes of on-line storage. The first Mini-Disk drive you purchase includes our powerful TRSDOS (Disk Operating System software) and Disk BASIC on diskette. This diskette allows about 50K of user storage space. TRSDOS and Disk BASIC use about 10K of the TRS-80's RAM, so a minimum of 16K is required, along with Level II and an Expansion Interface. Each of the diskette's 35 tracks consists of ten 256-byte sectors. Certain system information and a directory are required on each diskette, leaving 85,760 bytes of space available (each) on the second, third, and fourth drive. A 13,000-byte program which takes 3 1/2 minutes to load from cassette tape (Level II) will load in less than 20 seconds from disk. And you may read information one file after the other (sequential), or go directly to any sector without reading the preceding files (random). The system diskette containing TRSDOS and DISK BASIC must always be in your first drive unit. TRSDOS allows you to copy a diskette (BACKUP), even in a one drive system. Specifications: Disk Format: 35 Tracks; 10 Sectors per Track; 256 Bytes per Sector; 89,600 Bytes per Diskette. Disk Size: 5 1/4" floppy disk. Data Transfer Rate: 12,500 bytes-per-second. Disk Speed: 300 RPM. Latency: 100 mS (average). Track Access Time: 200 mS average, 600 mS to cross all 35 tracks. Average Backup Time: 1:10 minutes (including formatting). Memory Usage: TRSDOS, 4.2K RAM; DISK BASIC, 5.8K RAM. Power: 120VAC, 60 Hz, 35 watts, U.L Listed. Size: 6 1/2 x 3 1/2 x 13 1/4"
Hard Disk Drive (5MB) 26‑4130 $2,495.00 Our 5 megabyte Hard Disk System gives you vastly increased data stora e with exceptionally fast access and ease of use. Winchester technology can provide dramatic improvements in speed. The advanced operating system's many superior, user-friendly features make file handling a breeze. Store over 1000 different files per disk system or create files as large as the available space. The directory is alphabetized to make locating and accessing files quick. High-level communication is available through an advanced communication package that allows direct downloading to disk. A print spooler is included, too. The Job Control Language allows you to compile and later execute a predefined series of commands, including screen and audio alerts, conditionals, and user interaction to make many large scale operations virtually automatic. BACKUP, in addition to ordinary backup functions, permits backing up only those files that have been modified, or modified in certain date ranges, or even those that do or do not already exist on the destination disk. When backing up from hard disk to diskettes, the system will span a large file across multiple diskettes and allow easy identification of diskettes when recreating a file on the hard disk. Other features include keyboard typeahead for fast data entry, a versatile printer output formatting program, key redefinition, and more. Extensive user's manual included. U.L. listed. 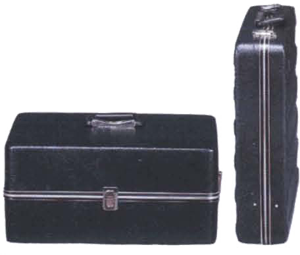 TRS-80 System Carrying Case Set 26‑500 $69.00 Take your TRS-80 system with you wherever you go! One case holds the video monitor, the other holds the keyboard unit, power supply. cassette recorder, cables and cassettes. Black molded vinyl. Hand carry only-not designed for shipping purposes. TRS-80 Anti-Glare Mask 26‑511 $16.95 Reduce glare with no loss of resolution. Reduces eye strain and fatigue. Installs easily in seconds. 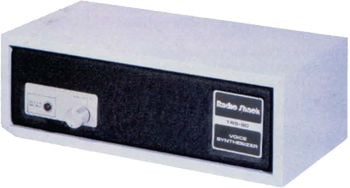 Voice Synthesizer 26‑1180 $399.00 Now you can program your TRS-80 to speak. It's not a pre-recorded human voice, but electronically 'synthesized" speech projected through a built-in speaker. It plugs into your TRS-80's bus connector on keyboard or Expansion Interface. Programming spoken words is done by typing combinations of some 60 "phonemes" representing spoken sounds. Requires Level I or II-16K RAM preferred. 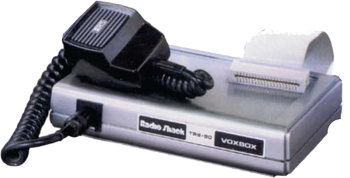 TRS-80 VoxBox 26‑1181 $169.95 Experiment with "voice recognition" on your TRS-80. That's right, speak into a microphone attached to the VOXBOX and you can program your TRS-80 to respond to your spoken words. Computer voice recognition is a new field, and not fully developed, but here's your chance to experiment with this exciting new technology. Level II required. Place this unique instrument on a map, chart, or plan of any size. Works with an 11x17" area. Swivel head allows operation in vertical plane. Input coordinates quickly, easily to your computer. Measure areas, lengths, distances and more. Point and continuous modes. Includes software for basic applications. U.L. Listed. Specifications: 100 Lines per inch. Repeatability: +/- 2 LSD. Repetition Rate: up to 100 points/sec. Size: 2-1/4 x 15 1/2 x 4 1/4" Power: 120 VAC, 60 Hz. Operation: Point or Continuous mode. Network I Controller 26‑1210 $499.00 A breakthrough in computerized classroom instruction! Network I allows teachers to upload and download programs to as many as 16 TRS-80 student stations. LED lamps indicate when a program transfer to or from a station is in progress. The system requires a Model I "host" computer equipped with at least one Mini-Disk drive. Student stations should have Level II BASIC. Network I Controllers can be cascaded to connect more stations. Includes cables. Maximum distance to student station is 30 feet. For Model I and Model III TRS-80's at 500 baud. U.L. Listed. Network II Controller 26‑1211 $499.00 Network II allows teachers to upload and download programs to as many as 16 TRS-80 student stations. Requires a Model I or III "Host" computer with at lease one Mini Disk drive and up to 16 Model I or Model III student stations, or a Color Computer with disk for "host" and up to 16 Color Computers for student stations. Controllers can be cascaded to connect more stations. Includes cables. Network III Controller 26‑1212 $599.00 The Network 3 connects up to 16 TRS-80 Model III student stations to a host Model III. The Network 3 system software gives each student station access to the host computer's disk drives and attached printer. Each student station can SAVE and LOAD programs directly to and from the host, and LLIST and LPRINT to the host printer. (Printer access requests are "spooled" at the host until the printer is free.) Files on the host diskette can be directly manipulated from student staions, allowing automatic student record keeping. System software and special Network 3 cables and adapters will be available separately. Minimum Student Station - 16K Model III with Model III BASIC and RS-232 board. 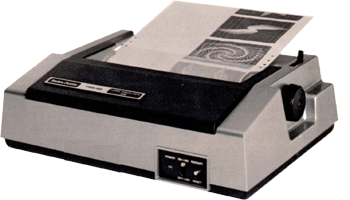 Minimum Host System - Model III 32K disk system (printer optional). Plug-N-Power Module 26‑1282 $39.95 Now your TRS-80 Model I, Model III or Color Computer can control up to 256 lights and appliances automatically! The Controller connects to the cassette port of your TRS-80 and sends the computer's commands through the existing AC wiring to the plug-in Remote Modules (sold separately). Has a built-in real time clock and a switch permits normal cassette operation. Software included. 4K Level I, Level II or Model III BASIC required. U.L. listed. (Tractor) $1,559.00 TRS-80 Line Printer I is a medium speed 5x7 dot matrix printer suitable for business, education, and home use. It uses the standard 64-character upper case ASCII character set, but does not support TRS-80 graphics. It uses only fanfold paper with feed holes in the margins and will produce up to 5 carbon copies. A continuous-loop cloth ribbon lasts approximately as long as a standard typewriter ribbon. The width of the letters, or "print density" is continuously variable from 10 to 16.5 characters per inch. Print density affects print speed. At maximum density the printers will produce 132-character lines at a speed of 21 lines per minute. Tractor-feed is required for multiple copes and exact placement of type on preprinted invoices, payroll checks, etc., Tractor width is adjustable from 3 to 11.5 inches. Top of forms control is available through software. Requires Level II (or DISK BASIC), a connection cable and Expansion Interface. All Level II PRINT commands except PRINT@ can be used (preceded by an "L"). Includes manual. 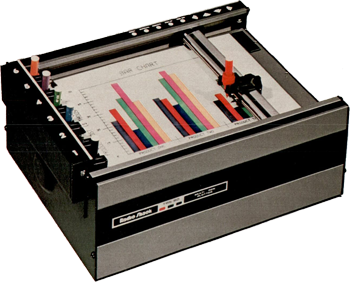 TRS-80 Line Printer II 26‑1154 $970.00 Prints 50 characters per second on 8-inch lines of 80 characters each. Also prints expanded (wide) letters under software control. Features upper and lower case letters in a 7x7 dot matrix format and will operate in both friction-feed and pin-feed modes. Continuous forms 9 1/2" wide (original and up to two copies) are kept in precise alignment by nonadjustable pins built into the platen. Also prints single sheets. When used as a friction-feed unit, inexpensive roll paper fits in a detachable rear bail. TRS-80 Line Printer III 26‑1156 $1,960.00 For applications requiring higher speed and full 13-inch wide, 132-character lines, Radio Shack's new Line Printer III is the answer! This quiet, professional printer includes many outstanding features ... even "self-test!" 9x7 dot matrix upper and lower case letters, as well as numbers, are printed at a fast 120 characters per second. For even faster "throughput," the head prints in both directions as it moves across the paper. Accurate positioning of pre-printed forms such as invoices or checks is easy, with controls for line-feed in increments as small as 1/8th-line. Expanded (wide) characters may be software selected for headings or emphasis in your printed reports. The fully adjustable tractor mechanism feeds contiunous forms of varying width up to a maximum of 15 inches, while assuring accurate alignment. 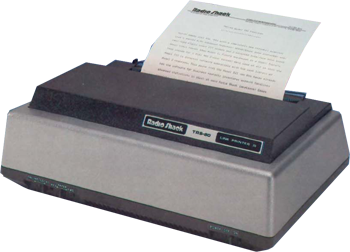 Drive motors run only during actual printers, so Radio Shack's Line Printer III can always be silently awaiting your print command, on either TRS-80 Model I or Model II. 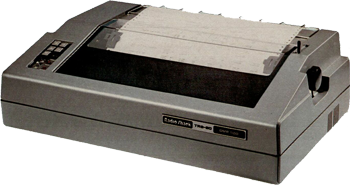 For the finest in fast, versatile printers, specify Radio Shack's all new, exclusive, Line Printer III. TRS-80 Line Printer IV 26‑1159 $999.99 Produces upper/lower case characters approaching "letter quality" Prints 80 or 132 columns on 8 lines, or high-density proportionally-spaced Nx9 dot matrix characters under software control. Handles roll paper 9-1/2" fan-fold or single sheets with two carbons! Detachable roll paper holder. U.L. listed. Specifications: Print Density: 10 or 16.7 characters per inch - proportional 8.2 to 24.6 characters per inch. Print Speed: 50 characters per second, 22 Lines per minute. Dimensions: 15 x 11 x 5". Weight: 12 lbs. Power: 120VAC, 60 Hz, 100 Watts. U.L. Listed. TRS-80 Line Printer V 26‑1165 $1,860.00 Our best line printer, designed for heavy business use. Bidirectional, logic-seeking dot-matrix. Prints quality 7x9 upper and lower case characters, with descenders, 132 columns wide. Adjustable fine-line increments for using preprinted forms. The tractor mechanism will handle any fanfold computer paper up to 15" wide, up to five sheets. New LP V features include 160 cps speed, underlining, 7.5 and 15 CPI optional character sizes, 26 European characters, and 30 graphics patterns. On-line/Off-line switch. Specifications: Print Density:5, 7.5, 10, 15 plus Bold 10 cpi, software selectable. Print Speed: 160 characters per second, 60 lines per minute. Dimensions: 7-2/5 x 24-2/5 x 15-9/10". Weight: 42 lbs. Power: 120VAC, 60 Hz, 85 Watts. 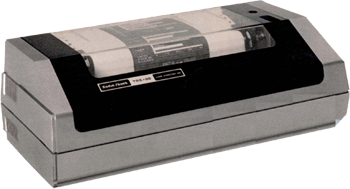 TRS-80 Line Printer VI 26‑1166 $1,160.00 A price breakthrough! Full 132 column printer at an unheard of low price. Low-profile styling and small size make this an ideal printer for Model III. Print Nx9 upper and lower case characers in 4 print sizes, as well as many graphic characters and special symbols. Bidirectional logic-seeking printhead. Uses 4" to 14-7/8" fanfold or single-sheet paper of up to 3 sheets. Built-in self-test. Removable, adjustable forms tractor included. U.L. Listed. Specifications: Print Density: 10 characters per inch; 5, 7.5, 15 characters per in optional. Print Speed: 100 characters per second, 33 lines per minute. Dimensions: 24-1/5 x 6-3/10 x 13-3/10". Weight: 28 lbs. Power: 120VAC, 60 Hz, 85 Watts. 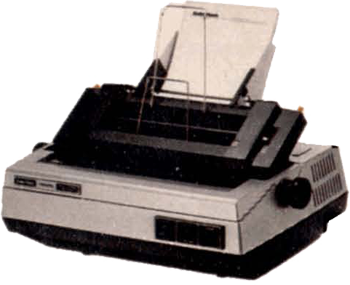 TRS-80 Line Printer VII 26‑1167 $399.00 The benefits of a much higher-priced printer! Serial interface works directly with Color Computer. Bit Image mode allows printing of hgih-density graphic information, similar to that on the Color computer screen. Prints 80 upper and lower case 5x7 matrix characters on an 8" line. Provides paralell interface for use with Models I, II, III. Adjustable tractor, 4-1/2 to 9-1/2". Uses standard 9-1/2" fanfold paper. Includes re-inking ribbon cassette. U.L. listed. Specifications: Print Density: 5 or 10 characters per inch. Graphic Density: 3780 dots/sq. in. Print Speed: 30 characters per second, 16 lines per minute. Character Set: 96 ASCII. Bit Image: 480 addressable 7-dot cols. Dimensions: 5.32 x 16 x 8.25". Weight: 8.6 lbs. Power: 120VAC, 60 Hz, 85 Watts. 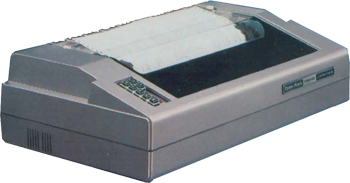 TRS-80 Line Printer VIII 26‑1168 $799.00 A compact, high-density dot-matrix impact printer! The 9-wire head prints near letter-quality, proportionally-spaced characters in each line. Good-looking 9x8 monospaced characters, normally at 10 cpi (80 char. per line), can be elongated or condense. Proportional characters and bit image dot information can be elongated - offering a wide range of character styles. Features full or half-line forward and revers; underline capability; superscript, subscript capability; upper and lower case English letters, European symbols, and block graphic characters; selectable parallel orserial interface. Uses 9-1/2" fanfold, sing sheet, and roll paper. On-Line/Off-Line, Restart/Reset controls, Powert LED. U.L. listed. Specifications: Print Density: 4.35 to 22.2 characters per inch. Graphic Density: 4320 dots/sq. in. Print Speed: 40 to 100 characters per second, 23 80-col. lines per minute. Character Set: 96 ASCII + 32 international and 30 graphic. Bit Image: 480 addressable double 7-dot cols. per line. Fixed Pin Feed: for Standard 9-1/2" fanfold paper. Dimensions: 4.7 x 15.4 x 11". Weight: 16.5 lbs. Power: 120VAC, 60 Hz, 85 Watts. For any job that requires a small, single-copy printout, our Quick Printer will fill the bill. It's a fast. compact, low-cost line printer ideal for general use. The Quick hinter delivers 160 lines per minute on a roll of 4.75-inch wide aluminum-finish paper. No ribbon is needed to produce a black-on-silver copy which makes excellent reproductions on office copiers. The paper is unaffectad by light, heat or humidity. All TRS-80 keyboard characters (except arrows) can be printed. Upper and lower caseletters are printed, although they all appear as upper case on the monitor. TRS-80 graphics are not supported. All Level-II line printer commands are used. Characters are formed by a 5x8 dot matrix. Variable character width (20. 40, or 80 characters per line). automatic underlining and an audible signal are all fully software controllable. Features paper-empty light, print select (or/off). paper advance and power or/off switch with pilot light. 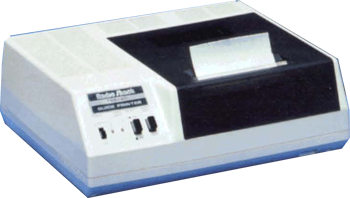 The Quick Printer requires the Expansion Interface, Level-II BASIC and a connecting cable. Delivers 150 lines per minute on 4.75-inch wide aluminum-finish paper. No ribbon is needed. The paper is unaffected by light, heat, or humidity. Prints all keyboard characters (except arrows), and upper and lower case letters. Graphics are not supported. Variable character widths (20, 40 or 80 characters per line), automatic underlining and an audible signal are all fully software controllable. All Level II line printer commands are used. Features paper-empty light, print select (on/off), paper advance and power on/off switch with pilot light. Requires either Expansion Interface, Printer Cable and Level II BASIC or Printer Interface Cable and Level II BASIC. Specifications: Print Density: 20, 10, or 5 characters per inch, software selectable (80, 40 or 20 cpi). Print Speed: 150 lines per minute. Paper: Aluminum coated roll, 4.75" wide by 131' long. (Available through Radio Shack stores). Dimensions: 4 1/4 x 13 x 10 1/2". 10 lbs. Power: 120 VAC, 60Hz, 40 Watts. U.L. Listed. Quick Printer II 26‑1155 $219.00 A "mini" line printer priced to fit everyone's budget. And best of all, it can connect directly to your TRS-80 - it needs no Expansion Interface. Software selectable for 16 to 32 character lines. Prints upper and lower case and features automatic "wrap around" when text exceeds line length, so there's no data lost to overflow. 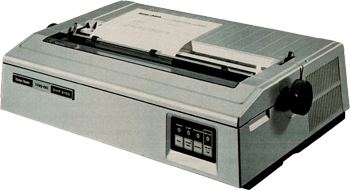 A built-in microprocessor controls the printer and communications with other units. With three interface choices, this versatile printer can be used on a variety of computers. Get low-cost, hard copy output on a 2 1/8" wide roll of aluminum-coated paper. Includes cable to connect to CPU. High-speed interchangeable character wheel and carbon ribbon give you the electric typewriter quality you need for your important word-processing jobs! 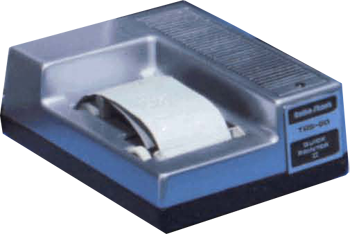 A friction-feed roller takes paper up to 16-1/2" wide and up to 6 copies. 124 characters including underline plus reverse tab/line feed. Built-in self test. U.L. listed. Specifications: Print Density: 10 characters per inch. 136 columns with supplied Courier print wheel. Print Speed: 43 characters per second, 19.5 lines per minute. Interface: Parallel. Ribbon Life: 200,000 characters; Print Wheel: 40 million characters. Dimensions: 8 x 24-3/5 x 15-1/2. Weight:28 lbs. Power: 120VAC, 50/60 Hz, 141 Watts. U.L. Listed. For fast, superb quality printing depend on the TRS-80 Daisy Wheel II. With its high-speed interchangeable character wheel and carbon ribbon, you get the "electric typewriter" look you want for your important typewritten documents. And when you're ready for a different character style, just snap in another print wheel. Each wheel provides clear, clean printing of up to 40-million characters. The printer features 124-character print wheels, forward and reverse paper feed and 1/2-line feeds, underline, backspace, friction-feed mechanism adjustable for up to 5 carbons, and switch selectable print densities (10 or 12 characters/in. or proportional pitch). Prints an average of 43 characters per second (500-plus words per minute). Comes supplied with Courier 10 print wheel. U.L. listed. Specifications: Print Density: 13.6" Line; Switch selectable 10 cpi (136 characters per line); 12 cpi(163 characters per line); or proportional spacing. Appropriate print wheels required for proper appearance. Print Speed: 43 cps Nominal; 19.5 LPM at 10 cpi, 132-col. (Approximately 500 words pre minute minimum). Carriage Motion: Unidirectional, logic seeking. Character Set: 124 (96 ASCII + international), 17 control codes. Paper: Up to 16" paper, original plus 5 copies, friction fee. Ribbon: Multi-strike carbon cartridge - 250,000 nominal characters - may vary with text used. Nylon cartridge - 1.6 million characters. Interface: Standard 8 Data Bit paralell; 36-pin Ampenol connector. Power: 120 VAC, 50/60 Hz, 141 watts. U.L. listed. Size: 8 x 24-1/2 x 15-1/2". Weight: 28 pounds. DMP-100 26‑1253 $399.00 Prints high-density graphic information similar to that on the Color Computer screen (with optional screen print program). Features 480-byte full-line dot buffer, selectable parallel and serial interfaces (600/1200 baud) and adjustable tractor, 4-1/2 to 9-1/2". Uses up to 9-1/2" fanfold paper. With ribbon cassette. U.L. listed. Specifications: Print Density: 5 or 10 characters per inch. Graphic Density: 60 x 63 dots per sq. in. Print Speed:Character Set: 96 ASCII. Bit Image: 480 addressable, 7-dot columns. Dimensions: 5-5/16 x 16 x 8-1/4". Weight: 8-3/5 lbs. Power: 120VAC, 60 Hz, 15 Watts. DMP-200 26‑1254 $999.00 A versatile, compact dot-matrix impact printer! Prints 80 characters at 10 pitch, 132 characters at 16.7 on an 8" line. Features selectable parallel and serial interfaces (600/1200 baud). Line feed in 1/6, 1/8, 1/72 increments. On/Off Line, Restart and Paper Feed controls. Power-On indicator. U.L. listed. Specifications: Print Density: Standard 10 spi - 104 lpm/20 col., 80 lpm/40 col., 55 lpm/80 col.; Correspondence 10 cpi - 520 wpm. Pin Wire Diameter: 0.35mm. Horizontal Dot Resolution: 60-100 dots/inch, 480-800 dots/line. Dimensions: 5 x 16-1/2 x 13-1/2". Weight: 16-1/2 lbs. Power: 120VAC, 60 Hz, 85 Watts. DMP-400 26‑1251 $1,195.00 Cover design aids in noise reduction. Line feed in 1/6, 1/8, 1/72, 1/216 increments. Tractor allows use of 4" to 15" fanfold paper. Friction platten for single-sheet paper. Prints original, plus two copies. Selectable parallel and serial interfaces (600/1200 baud). Paper Feed and Form Feed controls. On-Line indicator. U.L. listed. Specifications: Print Speed: Standard 10 cpi - 181 lpm/20 col., 126 lpm/40 col., 78 lpm/80 col., 51 lpm/132 col.; Correspondence 10 cpi - 705 wpm. Pin Wire Diameter: 0.30mm. Horizontal Dot Resolution: 60-100 dots/inch, 792-1320 dots/line. Dimensions: 4-11/16 x 15-3/8 x 11". Weight: 16-1/2 lbs. Power: 120VAC, 60 Hz, 85 Watts. DMP-500 26‑1252 $1,795.00 This hard worker is ideal for heavy business use. Logic-seeking head gives you fast speed and efficiency. Prints original, plus three copies. Adjustable tractor adjusts from 4" to 15". Line feed in 1/6, 1/8, 1/72, 1/216 increments. Paper advance in fil-line increments for aligning preprinted forms. Paper Feed and Form Feed controls. On-Line indicator. Parallel interface - use with TRS-80 Model I, II, III or 16. U.L. listed. Specifications: Print Speed: Standard 10 cpi - 293 lpm/20 col., 201 lpm/40 col., 119 lpm/80 col., 76 lpm/132 col.; Correspondence 10 cpi - 1043 wpm. Pin Wire Diameter: 0.30mm. Horizontal Dot Resolution: 60-100 dots/inch, 792-1320 dots/line. Dimensions: 7-11/16 x 24-5/8 x 15-7/8". Weight: 50 lbs. Power: 120VAC, 60 Hz, 180 Watts. DMP-2100 26‑1256 $1,995.00 A Radio Shack breakthrough! Delivers high-speed for data processing, high-resolution for dot-addressable graphics, plus a word processing mode with text that rivals Daisy Wheel printers! Prints 32,400 dots per square inch-over four times the finest resolution of our other dot-matrix printers! Produces letter-quality characters in a single pass for maximum throughput. Change pitch and font within your text without having to stop and change a print-wheel! U.L. listed. Specifications: Print Speed: Standard 10 cpi - 215 lpm/20 col., 151 lpm/40 col., 93 lpm/80 col., 60 lpm/132 col.; Correspondence 10 cpi - 774 wpm. Character Set: 96 ASCII, 31 international and 31 graphics characters. Print Density: 10, 12, 16.6 characters per inch, plus proportional-spaced and elongated. Paper: Up to 15" wide. Friction-feed. Pin Wire Diameter: 0.2mm. Graphics Resolution: 32,400 dots/sq. in. Horizontal Dot Resolution: 180 dots/inch, 2448 dots/line. Maximum Vertical Resolution: 180 dots/inch. Line Feed: Forward - 1/120, 1/12, 1/8, 1/6, 2/15-inch, Reverse - 1/12, 1/6 inch. Dimensions: 5-7/8 x 21-11/16 x 15". Weight: 44 lbs. Power: 120VAC, 60 Hz. 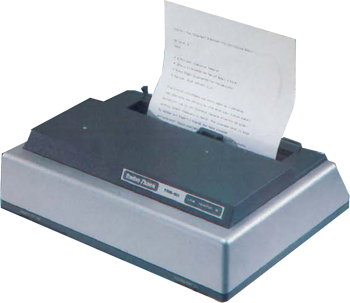 DWP-410 26‑1250 $1,495.00 Our new DWP-410 can produce hundreds of copies - each with that electric-typewriter "look". Select 10 or 12 characters per inch, or proportional pitch. Features forward and reverse paper feed and 1/2-line feed, underling, boldface, and and programmable backspace. You also get 1/120" space and 1/48" line feed. Automatic Paper Set makes paper insertion a breeze. Just place a sheet at the rear of the 15" platten and pull the Autoset lever. paper automatically rolls up to the first line position. "External Program Mode" lets you use print wheels with different pitch or special characters. With Courier 10 print wheel and carbon ribbon cartridge . U.L. listed. Specifications: Print Density: 13.6" line. Switch selectable 10 cpi (136 characters per line), 12 cpi (163 cpi), or proportional spacing. Print Speed: 25 cps nominal; 11.7 lpm at 10 cpi, 132-column (Over 300 wpm). Carriage Motion: Unidirectional optimal motion seeking, 1000 ms slew rate. Character set: 124 (96 ASCII, plus special and international), 23 control codes. Paper: up to 16" wide. Original, plus 5 copies. Friction feed. Ribbon: Multi-strike carbon or nylon cartridge. Interface: Standard 8 bit data parallel; 36-pin Amphenol connector. Dimensions: 7-3/4 x 23-3/4 x 13". Weight: 35 lbs. Power: 120VAC, 50/60 Hz, 141 Watts. This intelligent plotter responds to simple BASIC commands to produce complex graphic plots up to 7-1/2" wide and any length. Character printing allows plotter to be used as a standard printer plus characters can be printed enlarged and/or rotated. Standard parallel interface. No ribbon, uses replaceable pen. U.L. listed. Specifications: Print Density: 9 characers per inch, 75-column line in standard mode. Print speed: 5 lines per minute horizontal. Bi-directional feed under software control with stepper drive. Dimensions: 8-3/4 x 14-4/5 x 7-1/2" Weight: 26 pounds. Power: 115VAC, 50/60 Hz, 100 Watts. U.L. Listed. 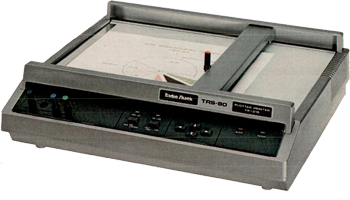 The TRS-80 Plotter/Printer can be programmed with simple BASIC LPRINT statements to draw a wide assortment of straight or curved lines and geometric figures, as well as the standard ASCII text characters. The writing device? An easily replaceable ballpoint pen! Features include four character sizes and rotations, front panel control of pen and paper motion and simple vector commands for drawing varied straight lines, arcs, circles, triangles and rectangbles. U.L. listed. Specifications: Printing speed: Average 10 characters/second. Step Speed: 667 steps/sec. Step Size: 0.095525 mm. X&Y axes. Characters/Line: 80 char./7.3" Paper Size: 9" roll paper. Life of Ballpoint Pen: Approx. 500,000 characters. Power Requirements: 120 VAC, 60 Hz. Dimensions: 6-3/4 x 16 x 12-3/5". Weight: 13.2 lbs. without paper. Specifications: Paper Size: 8.5 x 11". Plot Size: 7 x 10". Step Speed: 600 Steps/Sec. Step Size: 200/in. Power Requirements: 115VAC, 50/60 Hz. Dimensions: 6 x 13-1/2 x 10-1/2". Weight: 20 pounds. FP-215 Flatbed Plotter/Printer 26‑1193 $995.00 Draws using BASIC ASCII command codes and parameters. Prints text horizontally or vertically using BASIC LPRINT command. Single plotting-pens can be changed easily to make multicolor plots. Red, blue, green and black pens included. Features self-test and automatic print functions. 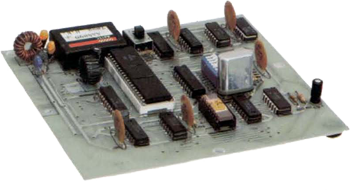 Includes parallel and RS-232 serial interfaces. U.L. listed. Specifications: Paper Size: 10-1/8 x 14-5/16 or 8 x 11-1/2". Plot Size: 7.32 x 10.63" or 8.5 x 11.73". Plot Speed: 100 mm per second (3.93 ips). Step Size: 1 mm. Dimensions: 4-5/6 x 16-1/8 x 14-5/8". Weight: 22 pounds. Power Requirements: 105-135VAC, 50/60 Hz, 90 Watts. CGP-115 Color Graphics Printer 26‑1192 $249.95 Creates beautiful graphics in red, blue, green and black, plus prints alphanumerics. Built-in commands simplify drawing and plotting. Text mode prints 40 or 80 characters per line at 12 characters/sec. Software controls additional character sizes and rotation. U.L. listed. Specifications: Paper Size: 4-1/2" roll. Effective Plotting Range: X-axis - 3.8 inches (480 steps), Y-axis - no limit. Plot Speed: 2.05 inches per second. Print Speed: 12 characters per second. Characters per Line: 80 or 40 (text mode). Any size from 1 to 80 per line (graphics mode). Dimensions: 2-15/16 x 8-3/4 x 8-1/2". Weight: 1-3/4 pounds. Power Requirements: 120VAC, 60 Hz, 23 Watts. Printer Interface Cable 26‑1411 $59.00 Lets you add a complete hard copy system without using the Expansion Interface. 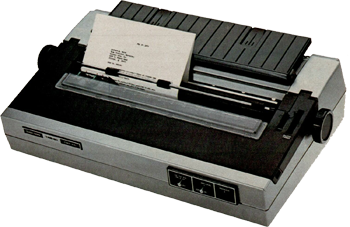 Connects directly from the TRS-80 bus connector to the Quick Printer or Line Printer I. Line Printer II Interface Cable 26‑1416 $59.00 Interfaces with Line Printer II without using the Expansion Interface. Connects directly to TRS-80 bus connector. Tractor Feed for Continuous Forms 26‑1446 $289.95 Just snap into place to use fan-fold paper with your Daisy Wheel II! Ideal for printing labels, multi-part forms, and long data processing runs. Removes easily when single sheets are used. 6-3/8 x 20-3/8 x 13". 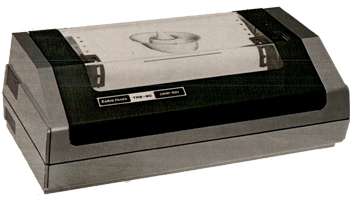 TRS-80 Acoustic Cover for Super-Quiet Printing 26‑1455 $399.00 Reduces Daisy Wheel II noise dramatically - ideal for office work areas! Cover lifts for easy access to your printer. 14 x 28 x 21-1/2" - fits perfectly on our TRS-80 Printer Stands. SW-302 Parallel Printer Switch 26‑1498 $119.95 Dual parallel ports for easy printer switching without changing cables. For any TRS-80 or data terminal with parallel interface capabilities. With power-on LED. 5 x 7-1/2 x 4". U.L. listed. AC Power module. Cables not included. SW-303 RS-232C Selector Switch 26‑1499 $149.95 Two switched ports for modems, digitizers, plotters and more. The other port is configurable, allowing communication between two computers. For any TRS-80 with RS-232C. 5 x 7-1/2 x 4". U.L. listed. AC power module. Cables not included. RS-232-C Serial Interface Board 26‑1145 $99.00 You can let your TRS-80 communicate with the "outside world" by using our TRS-80 RS-232C Serial Interface Board. It lets you connect the TRS-80 to a variety of accessories such as modems, card reader, line printers and acoustic couplers. The RS-232-C board mounts inside our Expanasion Interface. A cable is provided for connection to external equipment such as Radio Shack's Telephone Interface or perhaps your own serial line printer. Included is a comprehensive user's manual and a cassette tape program which allows the TRS-80 to act as an interactive terminal for communication with a remote timesharing computer. Baud Rate: Switch selectible in 8 steps from 110 to 9600 baud. Software contrallable in 16 steps from 50 to 19,200 baud. Stop Bits: Selectable 1 or 2. Word Length: Selectable 5 to 8 bits. Data In/Data Out Ports: Switch reversible. Logic State Sensing: Clear to end, Data set ready, Carrier Detect, Ring Indicator. Software Controllable Outputs: Data Terminal Ready, Request To Send. Software control: All functions except Data In/Data Out reversing are fully software controllable. TRS-80 Telephone Interface I 26‑1170 N/A Radio Shack's Telephone Interface I lets the TRS-80 "talk" with other computer equipment over the phone! After the proper number has been reached. you simply place your telephone handset in the Interface's cradle - without a single electrical connection to your telephone lines. 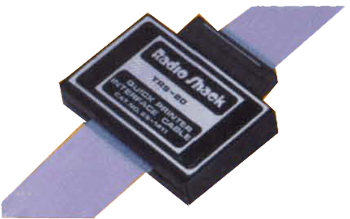 This Radio Shack coupler converts a serial stream of data from the TRS-80 RS-232-C interface into selective audio tones which are then transmitted over standard telephone lines. It can also reverse the process, decoding selective audio tones and feeding them into the TRS-80 throughthe RS-232-C interface. (The RS-232-C allows the TRS-80 to communicate with the outside world via a 2-wire connection, but with electrical signals. Since electrical signals cannot be sent over a voice telephone line, the Telephone Interface converts those signals to audio tones so that the connection can be made over long distances via telephone.) The TRS-80 Telephone Interface I operates in the "originate only" mode, meaning that it can send information to other hardware. It is capable of "two-way communication" only with another computer system having 'originate and answer" capabilities. Specifications: Baud Rate: 300 baud. Mode: Originate only, half or full duplex. Carrier Detection Level: -40 dbm. Transmit Level: -17 dbm at 1070 Hz. Power Requirement: 120VAC, 60 Hz, 5 Watts. U.L. listed. 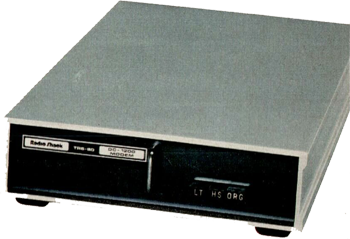 TRS-80 Telephone Interface II 26‑1171 $199.00 This is the fast way to transfer data from one location to another - by telephone with the Telephone Interface II. It's a full "originate/answer" acoustic coupler which allows two TRS-80's to talk to each other. You can also communicate with another computer which has "originate only" capability (like our Telephone Interface I). You can pass all types of data or prograas between computers, or one of you can operate the other's computer via the telephone lines. No direct connection to the telephone line is required. It's very simple to operate. Just dial the phone number at the location of the TRS-80 you desire to communicate with; after the connection is made, each telephone handset is placed on its interface. Now you're ready to receive and transmit data. Requires RS-232 Serial Interface Card, Expansion Interface, RS-232 Conununications Package and Level II. Adds versatility to your TRS-80. Specifications: Baud Rate: Up to 300. Mode: Originate and Answer, full or half duplex. Receive Sensitivity: -45 dBm. Power Requirement: U.L. listed 120-volt AC power module. Size: 2-3/8 x 4-3/4 x 10-1/4". Acoustic Couple AC-3 26‑1174 $149.95 Ideal for travelers! Just dial the desired number and place handset on interface. Half duplex also. Sensitivity: -43 sBm. 2-3/8 x 4-3/4 x 10-1/4". Direct Connect Modem I 26‑1172 $149.00 Connects directly to the telephone line and your computer, eliminating data loss due to microphonic interference. 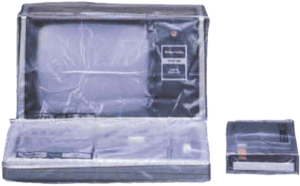 Provides full-duplex operation for TRS-80 Model II, Color Computer, as well as Model I and Model III systems equipped with RS-232 interface. Also provides half-duplex operation for Mode1 I systems without Expansion Interface or RS-232. Features selecable 300/600-baud operation, LED indicators, U.L. listed AC power module. FCC approved. Specifications: Baud Rate: 300. Modes: Compatible Bell 103 Ans/Orig modes. Full duplex. Sensitivity: -43 dBm (orig), -48 dBm (ans). Connectors: DB25 and 4-pin DIN. Power Requirement: U.L. listed 120-volt AC power module. Size: 2 x 6-1/2 x 7-1/2". Not for multi-line use. Direct Connect Modem II 26‑1173 $249.00 A fully-programmable direct-connect modem with Auto-Dial and Auto-Answer capability. Automatically dials or answers the phone, receives and transmits data, and even hangs up the phone. Remote and local test modes. LED indicators for On, Off-Hook, Terminal Ready, Carrier Detect, Transmit Data, and Receive Data. FCC Approved. Specifications: Baud Rate: 300. Mode: Originate and answer, full or half duplex. Receive Sensitivity: 45 dBm. Dial System: Rotary or tone. Power Requirement: U.L. listed 120-volt AC power module. Size: 2 x 6-1/2 x 7-1/2". Not for multi-line use. 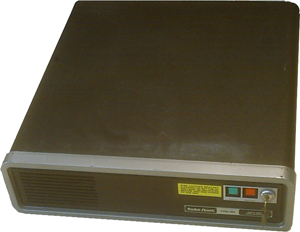 Direct Connect Modem DC-1200 76‑1005 $699.00 Ideal for anyone who regularly has big transmissions to handle. By quadrupling the baud rate, the DC-1200 will reduce each phone bill to a fourth of what it otherwise would have been. It's ideal for people who use electronic information services during business hours when long distance rates are at their highest. All you do is plug the power cord into a wall socket, the line cord into the phone jack and the connecting cable to our RS232C-equipped computer. It's always in "Auto Answer," so that if a host computer calls you (and your computer is properly configured), you can begin receiving information automatically. 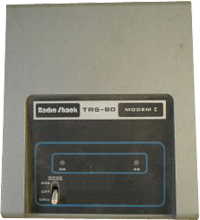 The modem automatically adjusts to the incoming baud rate. To originate, you just set the baud rate to match the host or service, run your communication software package, and place the call. And you can upgrade your DC-1200 for automatic origination. Specifications: Data Rate: 0-300-baud asynchronous; 1200-baud asynchronous or synchronos. Operating Mode: Full or half-duplex, all speeds; automatic answer, manual originate. Line Signals: Low Speed - frequency shift keying; High Speed - differential phase-shift keying. Compatibility: Low Speed - Bell 103/113; High Speed - Bell 212A. Sensitivity: -45 dBm. Dimensions: 1-3/4 x 6-3/8 x 11-1/4". Power: U.L. listed 120VAC, 60 Hz power module. FCC registered. Note: DC-1200 not for multi-line use without optional extra controller. Use only with Bell-compatible eqipment. Direct Connect Modem DC-1200 Auto-Dial Module 76‑1009 $149.95 To make your DC-1200 high-speed modem even more useful and versatile, add this handy accessory module. It allows the DC-1200 to automatically dial, as well as answer the phone (with proper computer configuration). This means your computer can operate unattended during low-rate night hours. Plug-in module is a printed circuit board. Installation required (not included). 1 to 5 Multi-Line Controller 43-233 $39.95 Allows direct-connect modems to be used with multi-line phones. TRS-80 System Desk 26‑1301 $199.00 Attractive and functional. Keyboard and Expansion Interface fit into desktop, with interconnecting wiring concealed. A bay under the desk can house from one to four Mini Disk Drive units. Add a Quick Printer and here's plenty of workspace left. 27 x 48 x 27"
Space Saver Stand 26‑1304 $49.95 It's only 37 3/4 x 23 3/4" but it holds a TRS-80, cassette recorder, CRT, Expansion Interface, Quick Printer and single or dual disk drives. Space saver was designed to hold your TRS-80 system and still leave ample room for work. The low-cost answer for home or educational users. Line Printer Stand 26‑1302 $99.00 Line Printer I and a number of others attach directly to the stand's crossmembers through existing holes in their rubber feet. The "modesty panel" turns sideways to accomodate many popular 15"-wide printers. (Not Line Printer III). Line Printer III Stand 26‑4302 $132.00 Puts the printer right at your fingertips and frees deskspace. Includes basket. 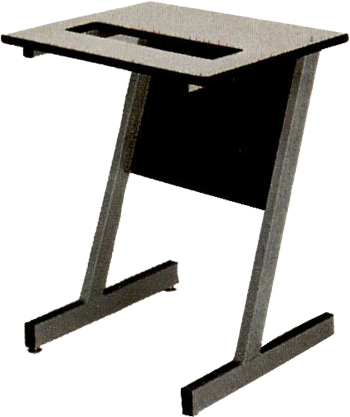 Universal Printer Stand 26‑1308 $99.00 This heavy-duty all-purpose printer stand is especially designed to match all TRS-80 systems. Sturdy, easily assembled. The following zip files contain everything you need to run the programs listed next to them. Each comes with a freeware TRS-80 emulator and is configured to automatically boot into a TRS-80 DOS with prompting to run the program you want. It is up to you to know how to unzip a file to a directory, and then to run the emulator. In this case, the emulator is entitled "model1.exe"
Adventure Series 190K Adventure Numbers are 1-D, Second Disk Has Solves. Please Read First. Leo Christopherson Series 111K Android Nim, Bee Wary, Dueling Droids, Dancing Demon, Voyage of the Valkyrie, etc. For more information about the Model I beyond that which is found on this web site, you may wish to visit Pete Cervasio's amazing website which has TONS of technical and descriptive information about TRS-80.